Location: Tarxien, Paola, Malta. 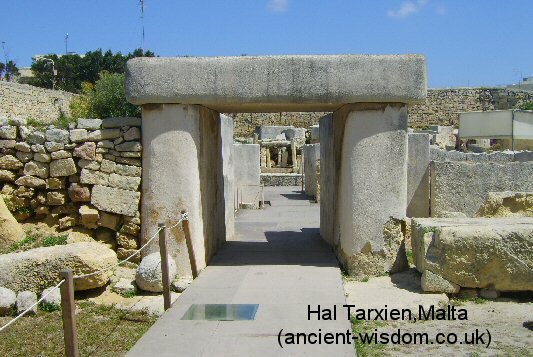 Grid Reference: 14° 30' 05" E, 35° 50' 00" N.
Hal Tarxien: (The Tarxien temples). 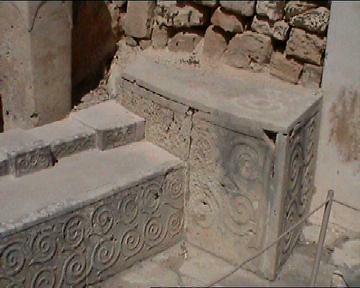 This temple complex lies close to the famed Hypogeum. 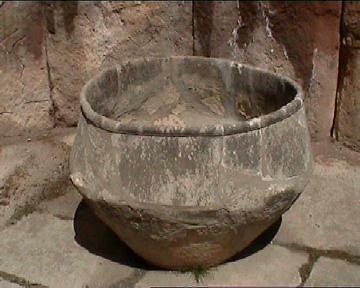 Dated to about 3,100-2,500 BC. 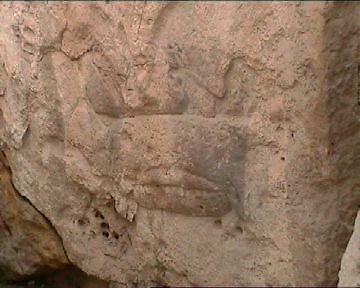 (2), 5,500 BC. (1). 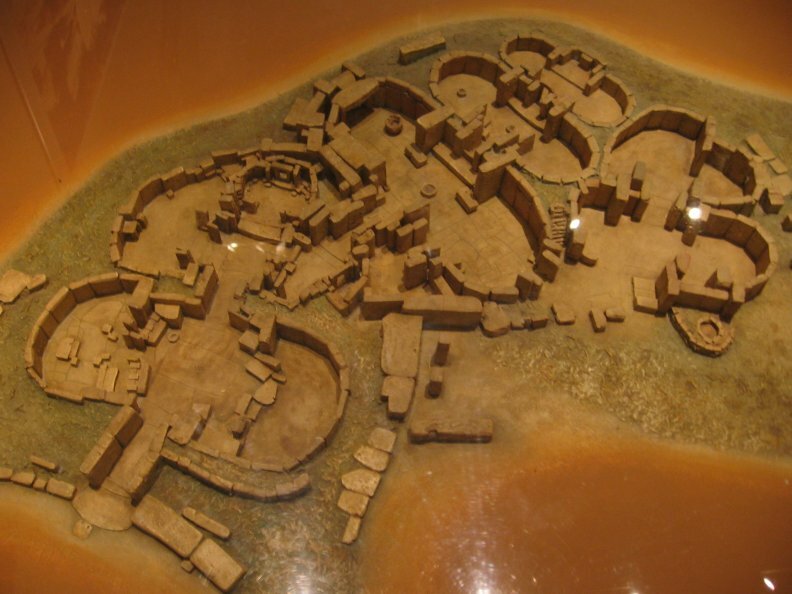 Several rooms have been excavated from a site that covers several acres. Inside the monumental main entrance (which is a modern reconstruction) of the temple, is the lower portion of a 'fertility goddess'. 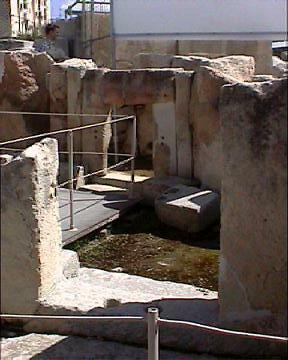 The South face of the temple houses a spring-fed cistern. 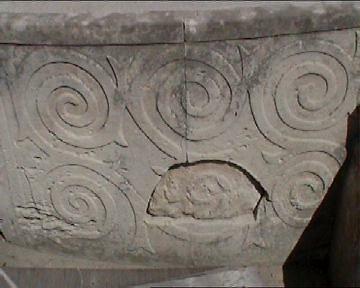 The central temple contains relief carvings of bulls and running spirals. When first excavated, the interior of these temples was noted to have been 'reddened by fire' (1). 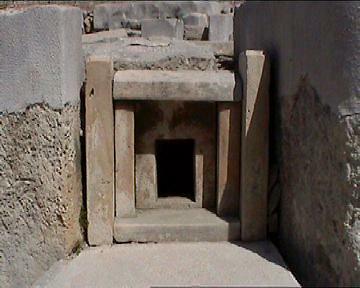 This temple lies only several hundreds of yards from the Hal-Saflieni Hypogeum, leading many to consider it the 'pair' to the underground temple. 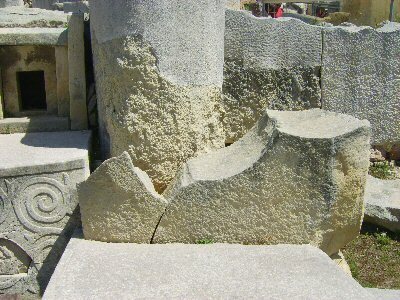 While other temples on the islands were certainly built with more grandiose stones, the wide variety of features and uses for stone seen at Hal-Tarxien cannot be matched anywhere else. 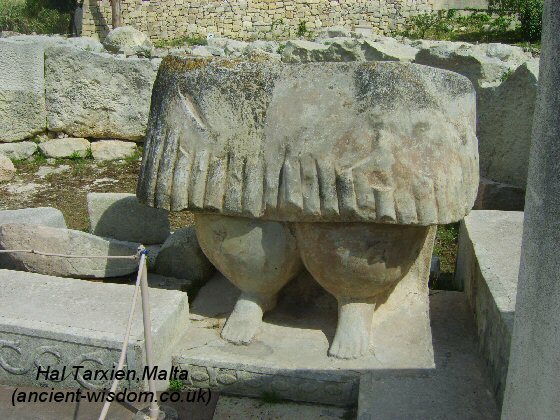 There are four distinct temple units at Tarxien. 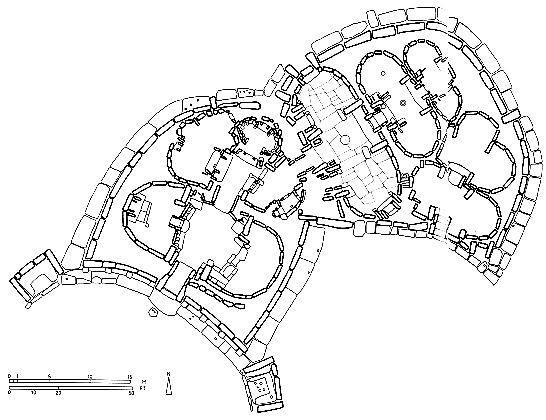 The oldest one, smaller of size an separated from the others, was built in the Ggantija phase and has the typical five-asped plan, just like Ggantija temple itself. 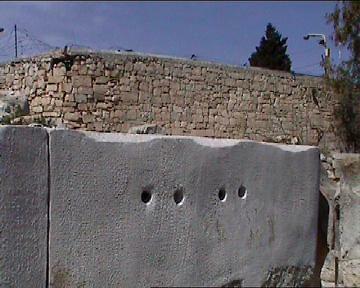 The other three are joined together by a common outer wall. The middle temple was the last one to be erected and was wedged between the other two, spoiling the symmetry of the complex itself. 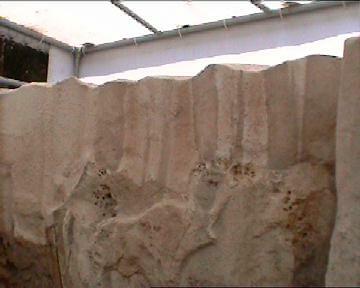 Reconstruction of the original facade based on fragments of a small clay temple found in the ruins. 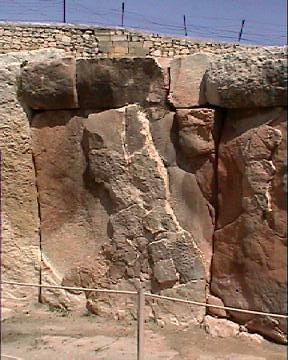 These huge rectangular blocks which lie to the extreme right of the entrance and to the left about 50ft each way are yet to be fully understood. 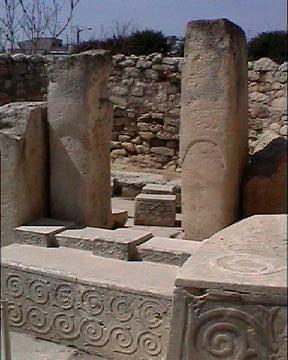 Originally, large slabs stood at the back of these rectangular stones to form the front wall of the building. 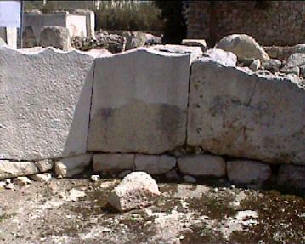 Of these wall slabs only a fragment, about 5ft wide remains behind the first block on the right. 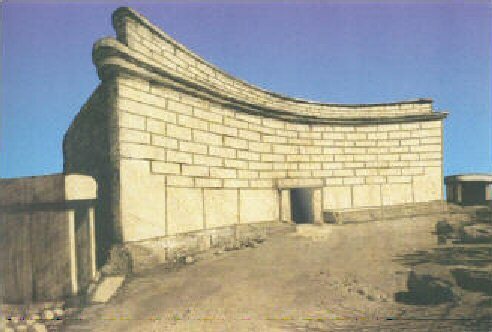 Each end of the semi-circular front wall ends in a remarkable structure, of which we can only conjecture a purpose. 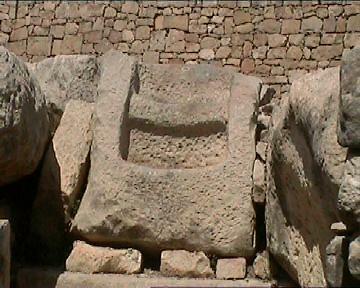 Zammit named these structures 'Divination Blocks' due to a lack of similar features on the island. 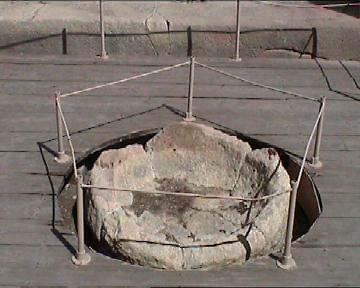 '...A step is cut in front, and a barrel-shaped stone stands before it. 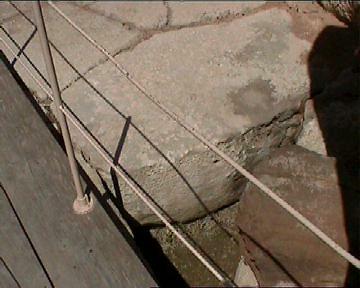 The surface of this block is slightly concave in the middle, with a flat ledge round three of its sides. 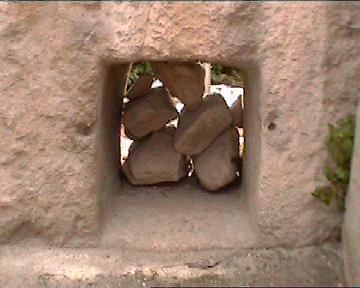 Six conical pits, about 1 foot deep, are cut deeply into this block, one on the edge and five on the square surface. The use for which this block of stone was intended is not apparent. 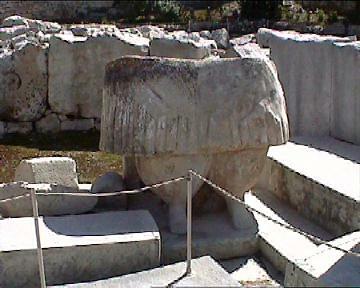 The Trilithon Entrance to the temple complex. The Trilithon entrance to the temple, now entirely restored in concrete.. Original image - before restoration. (Spot the difference).. Note the 'Divination' block on right. 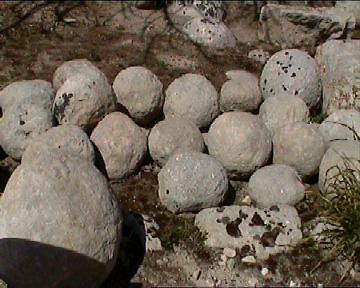 (left) A selection of stone balls, found near the entrance, believed to have been used to 'roll' the larger stones and/or for divination, (right) the stone 'hitching point' in front of the temple, a feature common to all the temples across Malta. 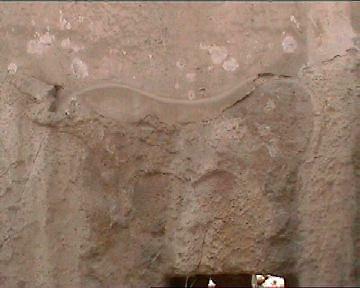 The reconstructed lower portions of the figure found on the inside right of the entrance. This is THE earth-mother-earth figure. The full-size model would have stood over 3m high. 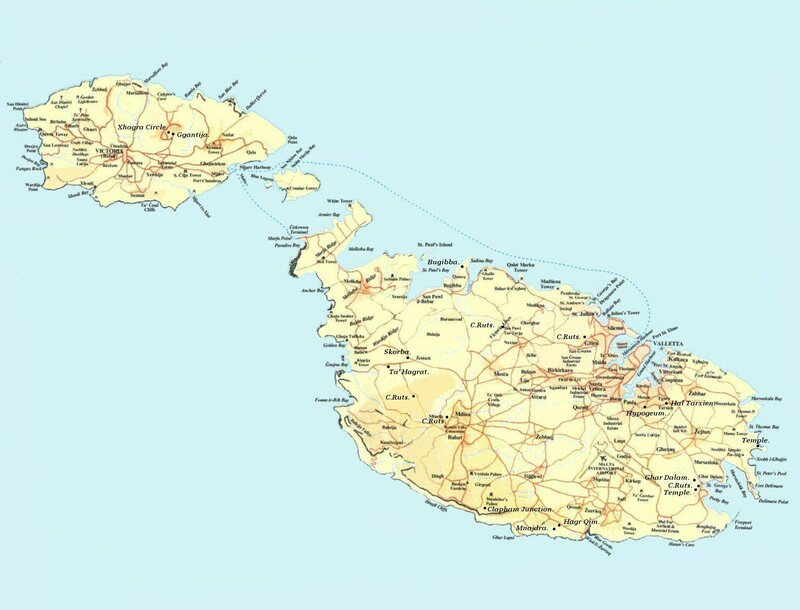 It has been suggested that it may have represented a male figure, but the numerous other female figurines found on Malta make this idea very unlikely indeed. 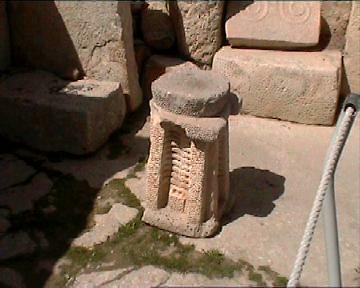 The original is balanced delicately in the museum of archaeology, Valleta. 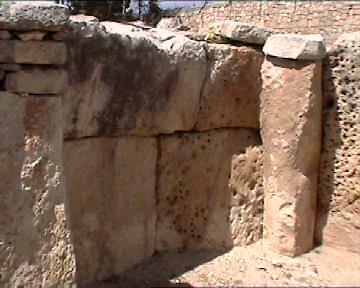 Familiar door-cut stones separate several of the chambers. 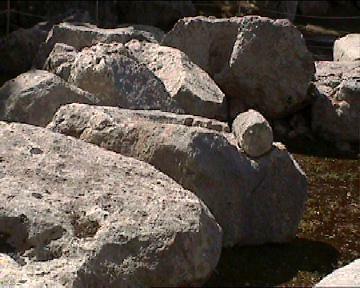 The tops of the stones are now concrete and were shaped like this as their original height is unknown. They were destroyed by farming while the site lay 3ft underground in Government fields. ...but those still standing are fitted together with beautifully squared corners. 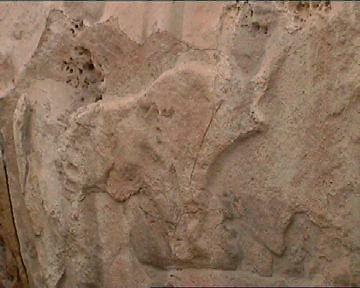 (The stones of this apse have been fire damaged, and are deteriorating). 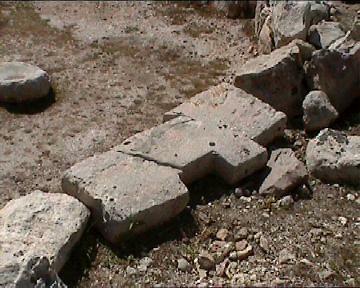 Left: Stone Hearth in the central area between apses. 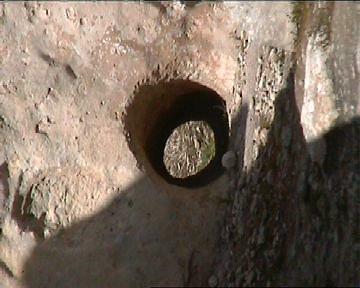 Right: A huge stone-cut 'libation bowl', a feature seen at several other prominent European megalithic sites such as Newgrange and Knowth in Ireland, and Maes Howe on the Orkneys, where they are associated with cruciform chambers in passage-mounds. 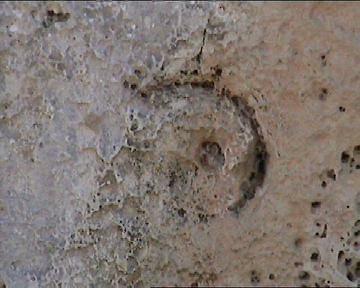 The spiral was not present in the commonly known European form. 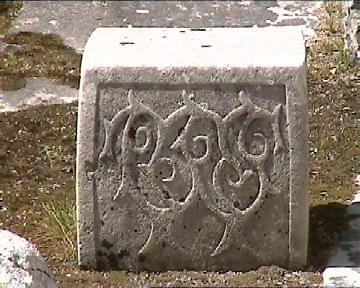 However, these numerous floral examples were similar to later Celtic and Norse styles. This spiral (?) 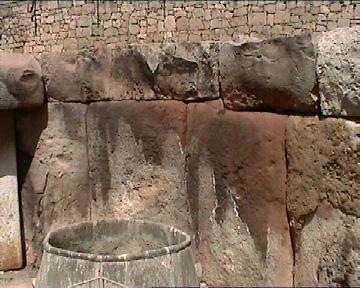 on the wall of the earth-mother chamber, although less well preserved, follows the traditional 'megalithic' design. 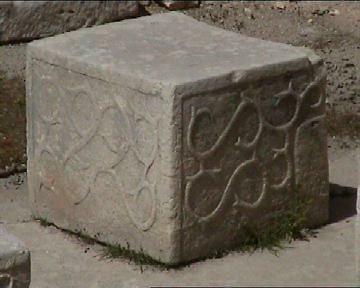 'Six of the steps are laid between the walls, the last two in a block of stone placed at the top of the stairs. 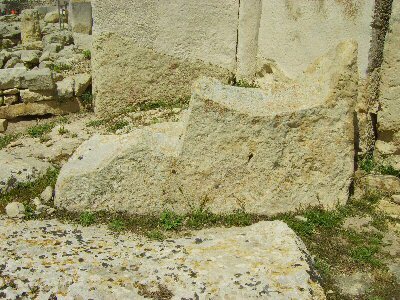 These steps lead to a terrace laid with beaten earth ending in the inner most chambers of the second temple ... 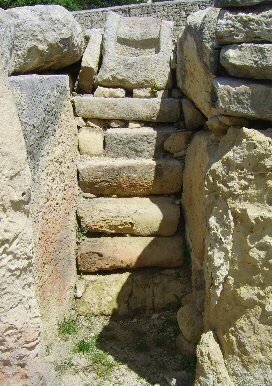 This stairway was used as a secret passage to the second temple supplementing the entrance obstructed by the decorated slabs ... The recess in which the stairs are constructed was originally part of the western apse, now reduced in size, formerly as deep as the eastern apse'. 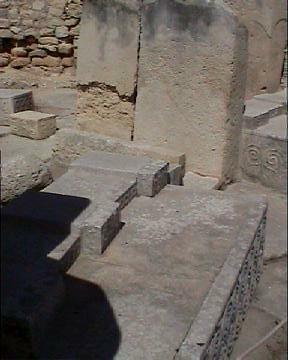 The stone now at the top of the stairs (left) shows a vague similarity to the one found at Hagar Qim (Photo right). Are these the two 'steps' Zammit mentions above. 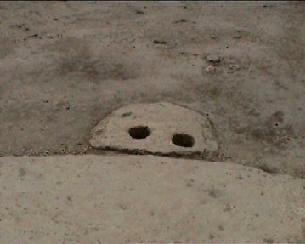 The immense paving stones that compose the floor are around a metre deep. 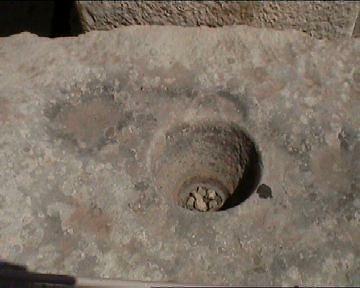 Many still have the small rounded stones under them from where they were rolled into position. They were all neatly carved to fit each other. 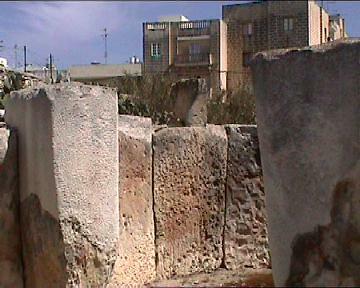 The walls were built with an inwards curve, a feature un-common at other Maltese temple complexes. 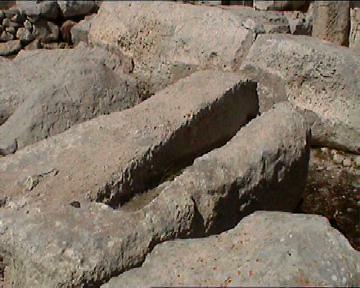 Some of the stones appear to have been similarly carved in preparation to receive other stones.. The site is littered with objects of lost significance. 1) David D. Zink. The Ancient Stones Speak. 1979. Musson Book Co.
2). G. Hancock. Underworld. 2002. Penguin. 3). Prof. T. Zammit. 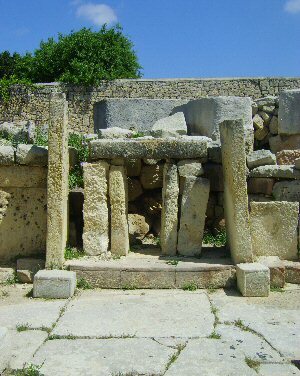 The Copper Age Temples of Hal-Tarxien, Malta. 4h Edition. 1966. Orphans Press, Gozo.